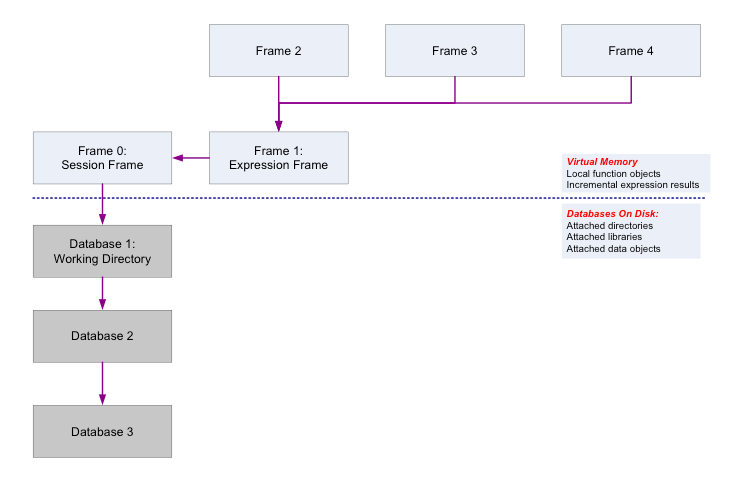 Local objects are stored in a frame in virtual memory (e.g. RAM). Frame 0 is called the session frame or “global environment” and exists as long as R is operational. Frame 1 and higher are created to support function execution only. Each of these frames contain a list of R objects with names and values. Objects stored in Frame 1 and higher are erased when flow control returns to the Console. The temporary use of virtual memory implies that functions offer an efficiency advantage over scripts as functions make little to no use of disk or virtual storage. Data objects that are global are stored in the .Data directory. As a result, they persist until they are explicitly removed (or the search path is altered). Scripts the contain no functions and expressions defined in the Console create global objects, they rely on hard disk storage, and they are fundamentally slower to process. Function assign() can also be used with its where argument to put (or to replace) objects in other databases. Object masking occurs when two or more objects have the same name but reside in different storage locations. The first object on the search path will be recognized and all others with the same name remain unreachable. In this case, get() copies myObject from the 3rd directory in the search path to the current working directory and assigns it a new name. The conflicts() function is also available to help check if system objects are being masked, whether intentionally or not. The function exists() checks if an object exists on the search path, or in a specific database if argument where is given. Extra directories, lists or data frames can be added to the search list with the attach() function and removed with the detach() function. Normally a new entity is attached at position 2, or to directory 2 on the search path.